Reason for Stay: Other Bilateral Secondary Osteoarthritis of Knee. How did this patient hear about Palmetto Subacute Care Center? Last year she had the same surgery on her left knee. She decided to came back to our community. Ms. Fernandez arrived to Palmetto Subacute Care Center from Kendall Regional Hospital on October 17, 2018 after a two day hospitalization. 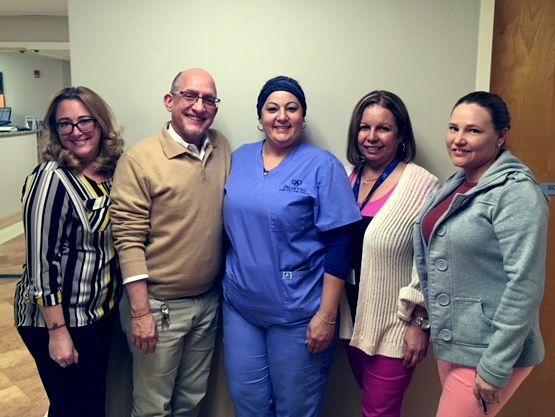 Ms. Fernandez was admitted for a right total knee replacement, something she was somewhat familiar with as her left knee was replaced on the 22nd of September. It was discussed that she would need skilled care in efforts of returning her home. The hospital assisted Ms. Fernandez and her family with the selection process, electing to transfer to Palmetto for rehabilitation upon hospital discharge. She worked with our team and her recovery journey was coming along smoothly. Much to her surprise and comfort, Ms. Fernandez’s healing was noticeable and continuously successful. Ms. Fernandez was welcomed and escorted to her room when she arrived to our community, and she was attended by our nursing staff shortly upon arrival. Already comforted in her room, Ms. Fernandez recalled some team members whom she has worked alongside in the past during her first experience at Palmetto. Needless to say, she had inquired and requested the same caregivers to assist her during her second journey. The team was confident in Ms. Fernandez’s abilities and potential for a full recovery. Ms. Fernandez received physical therapy five days a week. Her continued physical therapy services were necessary in order to assess functional abilities. Ms. Fernandez received occupational therapy also five days a week. She required skilled occupational therapy services to assess safety and independence with self care and functional tasks of choice. Ms. Fernandez continues her journey everyday in efforts of a fill recover and a safe return home. 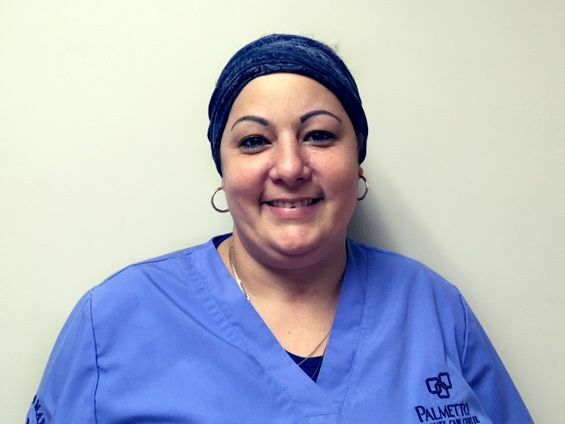 Congratulations to our Professional of the Quarter, Janelys Garcia de Jesus, CNA at Palmetto Subacute Care Center in Miami! Janelys Garcia de Jesus is now a finalist for the Professional of the Year contest; the winner will be announced during Nursing Home Week 2019! Congratulations Janelys Garcia de Jesus, you are #TheCareRiteDifference! How did this patient hear about Palmetto Subacute Care Center? From Social Worker at Baptist Hospital. Ms. Mirurgia Roque Pastrana is a 83-year-old female from La Habana, Cuba. She came to the United States of America in 1960, and lived in New York. She has two sons, both in California, and she is planning to move there to be near them. Ms. Roque arrived to Palmetto Subacute Care Center after hospitalization at Baptist Hospital post subdural hematoma. She suffered a mechanical fall on July 25th, which resulted in a small left subdural hematoma. Ms. Roque was evaluated by neurosurgery and was noted with dysarthria, right-side weakness, and confusion. When she arrived to Palmetto, she was welcomed by all nurses and technicians. Shortly after, the dietician spoke with her and reviewed her diet. Later in the day, she was evaluated by all therapy teams. The next day, our Director of Concierge discussed therapy, menus, and recreational programming with Mrs. Roque. Ms. Roque was referred to physical therapy due to her decrease in strength, decrease in transfers, reduced ability to safely ambulate, decrease in functional mobility, decreased neuromotor control, reduced ADL (Activities of Daily Life) participation, and reduced static and dynamic balance. Ms. Roque increased her independence and was able to facilitate with all functional mobility, promote safety awareness, enhance rehabilitation potential, facilitate motor control, increase coordination, improve dynamic balance, enhance fall recovery abilities, increase functional activity tolerance, and minimize falls. Ms. Roque was referred to the occupational therapy team to gain the ability to follow cues. She was presented to the therapy team with significant declines in functional mobility and overall ADL performance, and required the need for skilled therapy services in order to improve functions for a safe return home. After a week, Ms. Roque improved with toilet transfers and toileting tasks using grab bars and efficiently performed lower-body dressing with independence, Ms. Roque is fully oriented and gives a good reliable history; she is very active and able to ambulate independently. Ms. Roque requested to be discharged home on October 29th, 2018, and was. She was transported by her sister; she no longer needs any medical equipment or Home Health services. Ms. Rogue discharged from our community in good condition, stating that she was very pleased with her recovery and the professionalism of the staff! Mr. Reyes arrived at Palmetto Subacute Care Center on August 9th, 2018 after a hospitalization at Jackson Memorial Hospital. He is a 71-year-old patient who was unfortunately involved in a motor vehicle collision. He did not lose consciousness as he thankfully did not hit his head during the accident. He was admitted to a local trauma center, where he presented with a left closed acetabular fracture, left inferior pubic arm fracture, and intrapelvic hematoma. The orthopedic surgeon on staff was consulted for management of the fractures. 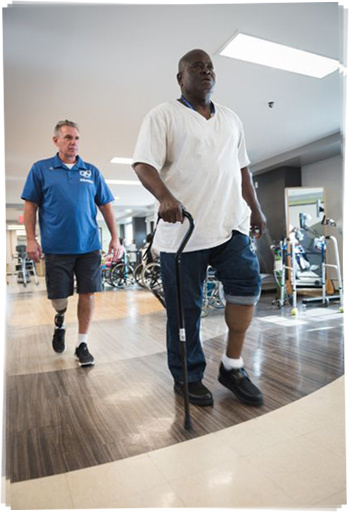 After a successful procedure, Mr. Reyes was notified that he would need intensive inpatient rehabilitation to support his healing. He and his family were given a list of skilled nursing centers, where they ultimately selected Palmetto Subacute Care Center! Mr. Reyes was warmly greeted by multiple professionals of the Palmetto team who anticipated his arrival. He was evaluated by both the physical therapy team (PT) and occupational therapy team (OT), and a treatment plan was put in place based on their objective findings. The team also developed a discharge plan and goal in coordination with his care plan. Mr. Reyes was able to perform bed mobility with maximal assistance and was able to transfer to his bedside chair using a standard walker with maximal assistance, requiring frequent verbal cues to maintain non-weight-bearing (NWB). Mr. Reyes was motivated and willing to participate with therapy. He is currently able to tolerate two hours of activity out of bed. 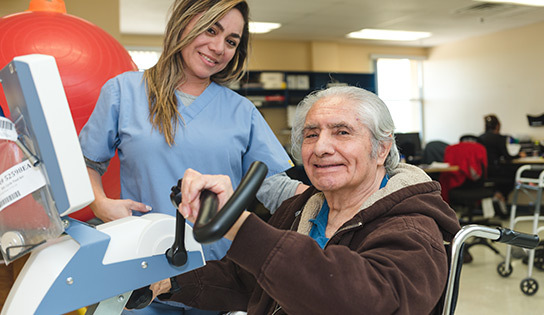 Mr. Reyes benefitted from compressive PT/OT in an acute intensive rehab setting, as opposed to a lower level of care in efforts to improve functional mobility. His goal was to continue intensive therapy in hopes of returning to an independent status and a proper transition back home. Mr. Reyes was known to be a very cheerful person during his time with therapy. He would even often bring his own music for extra motivation. “I already feel strong and I think it’s time to go home and go back to work,” shared Reyes. Posted in Case Studies, News and Events, News and Events, Uncategorized	| Comments Off on Coming Soon!